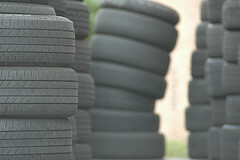 With an extended tire life, fewer tires will be wasted and placed into landfills. If gas tanks are draining family budgets, then they are probably draining fleet budgets, especially since you have more than two or three vehicles to worry about. Fuel is one of the largest expenses for a fleet, if not the largest. A quarter of government fleets surveyed said their fuel costs increased by 25% between 2006 and 2011. Any improvement in fuel efficiency is an improvement on the bottom line, and nitrogen tire inflation is a fuel efficiency improvement because it keeps tires at the right tire pressure for a longer period of time. Just having the right tire pressure can increase fuel efficiency between three and 10 percent, which is incredibly for a fleet of 100 or 1000 vehicles. Nitrogen can do this, and it compliments the fact that your drivers should already be checking tire pressure regularly and correctly. Proper tire pressure for a longer period of time improves fuel efficiency, but it also improves tire life. 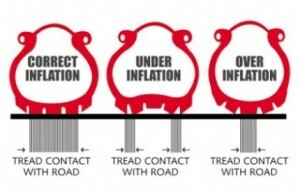 This is because tires that are over- or under-inflated, as shown on the left, don’t grip the road the same way a properly-inflated tire grips the road. Because the grip is different, the wear patterns will be different, meaning that the wear patterns for over- and under-inflated tires decrease their tire life. Tires with those wear patterns aren’t safe for driving and they will need to be replaced. Tires that are properly inflated will also wear slower, so they can be used for much longer while needing fewer retreads over the course of their lifetime. Regular air causes corrosion to inner liners, rims, and steel belts. Although regular drivers aren’t concerned about that kind of damage to their vehicles, commercial drivers and managed fleets ought to be a little more concerned. You need these vehicles to last as long as possible, and be as safe as possible, while not costing a boatload in maintenance. Nitrogen tire inflation can do this by extending tire life and extending the life of these parts without cutting corners or requiring a lot of investment over time. Once you have a nitrogen tire program in place and you have your employees trained in proper tire care, your fleet vehicles will be protected from these problems, giving you a significant advantage over your competitors, who will have to spend extra time and money keeping their vehicles in top shape. 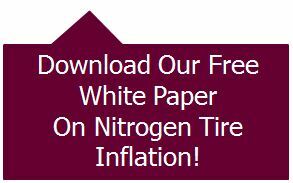 Firestone reports that with just one vehicle, you average about $116 per year in savings with nitrogen tire inflation. Granted, that’s not a lot and the practice isn’t necessarily worth it if you have just one vehicles. However, when you consider that the largest commercial fleet in the country has almost 100,000 vehicles, $100 per vehicle per year is a monumental amount of savings. Even though most fleets aren’t anywhere near that size, also consider that a fleet of 10 vehicles will save $1000 a year, which is also substantial for the small or medium-sized business that needs every dollar it can get.